Many debt settlement companies advertise that they can get credit card companies and other creditors to settle for less than half of what you owe when you file for bankruptcy. Unscrupulous companies do not fully advise consumers of: (1) the negative ramifications of debt settlement; (2) that most times they cannot get companies to settle for this low amount; (3) the impact on credit; (4) that you must have a large lump sum to pay off the creditor in most instances and (5) the tax impact of settling with a creditor at a lower amount. Many times these companies take money from the consumer and all the consumer winds up with is months of creditors' angry phone calls, plus a increased debt load as fees, penalties and interest are tacked on their original balance due. Many times creditors then file suit against the consumer anyway and no settlement is reached. In 2009, The States Attorney Generals across the nation have filed an official letter with the Federal Trade Commission, reporting that the number of complaints the states have received against debt-relief companies have consistently been rising and have more than doubled since 2007. Debt settlement companies cannot guarantee a debt settlement even though many charge large fees up front and then take a percentage of payments made to creditors. Furthermore, most creditors that are willing to settle require a large lump sum payment and most consumers do not have the money to fund a large lump sum payment. Speak to a qualified bankruptcy attorney to assess whether your should file for bankruptcy. If you really do not have the funding to settle with these creditors, bankruptcy could be the best strategy. Since your credit will be damaged anyway, the bankruptcy just may make more sense. You can try to work out a settlement yourself. There is nothing stopping you from contacting the creditor yourself if you see a way of handling it and negotiating the interest rate down or settling with a lump sum payment. 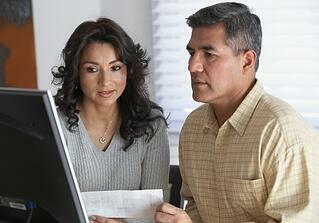 If the debt is too overwhelming, then it is best to consult with an attorney. Keep in mind the tax liability that will result from the debt settlement. For example, if you settle a $10,000 debt for $2,000 you are taxed by the IRS on the difference between the $10,000 and the $2,000. Thus, $8,000 is deemed to be income for you and you will get a tax bill for this income. There are exceptions but you must understand fully the ramifications. If you file bankruptcy, there is NO tax liability. You just have the debt wiped out and the IRS or state government cannot tax you. Review the contract that you signed with the debt consolidation or settlement company. Consult with an attorney before agreeing to anything. Be careful of any significant up-front fees. Do not agree to let the company take money directly from your bank account for payment. There are many scams out there and you have to be wary of agreeing to allow for a direct debit to your account. Contact your State Attorney General's office to check for any complaints against a company that you are considering using. If you are about to file bankruptcy, contact a New Jersey bankruptcy attorney from Scura, Wigfield, Heyer & Stevens, L.L.P. to discuss how to best proceed.